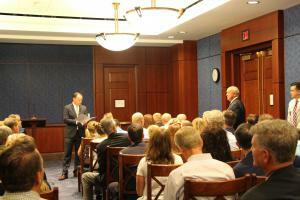 Each year the Salt Lake Chamber visits Washington, D.C. with a group of business, community and state leaders. 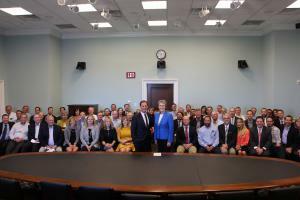 This trip represents a unique opportunity to connect our local leaders with members of our federal delegation. According to Mehlam, the big Trump wins include his approval rating among primary voters, the drastic drop in economically-significant regulations, and his impact on the federal judiciary. Where he loses is his inability to expand support beyond his base, the historically low staffing of the government, and his off-message tweeting that undermines policy pushes. Did you know the Federal Reserve Board Building, which houses the main offices of the Board of Governors of the Federal Reserve System, is named after Marriner S. Eccles? Eccles was Chairman of the Federal Reserve under President Roosevelt. 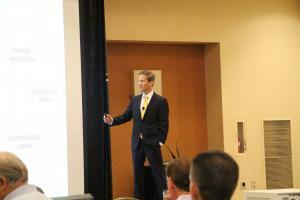 He was born in Logan, UT and became a U.S. banker, economist, and member and chairman of the Federal Reserve Board. The building was named after him by an Act of Congress on October 15, 1982. A bronze statue of “the father of the federal reserve,” now sits in the building’s lobby. When a disaster strikes everyone expects the President of the United States to get involved, but in the 19th century that wasn’t the case. During lunch at Charlie Palmer Steak, Tevi Troy told the story of the Johnstown flood of 1889 in which 2,000 people died. According to Troy, people of the Pennsylvania community sent word to President Harrison asking for help, but instead they received a telegraph back from Harrison explaining that disaster relief wasn’t really the role of the president, and encouraged the devastated population to instead reach out to the governor. It wasn’t until the Great Depression and WWII that the President of the U.S. was expected to get involved in disaster management. Troy is the President of the American Health Policy Institute. He is also the author of Shall We Wake the President and What Jefferson Read, Ike Watched, and Obama Tweeted: 200 Years of Popular Culture in the White House. Before he picked up his pen and began his career as a presidential historian, Troy was the Deputy Secretary of the U.S. Department of Health and Human Services. 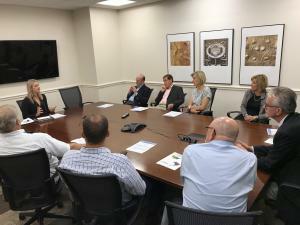 Minutes after announcing the Republican’s new tax reform plan, Senator Orrin Hatch met with Utah’s business leaders in the President Pro Tem Office. 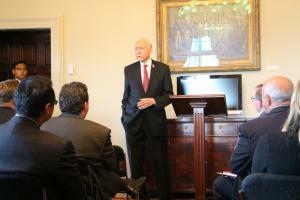 Hatch gave some insight into the plan that would cut corporate tax rate to 20 percent from 35 percent, make it easier for companies to bring profits back to the United States, and lessen the number of tax brackets. 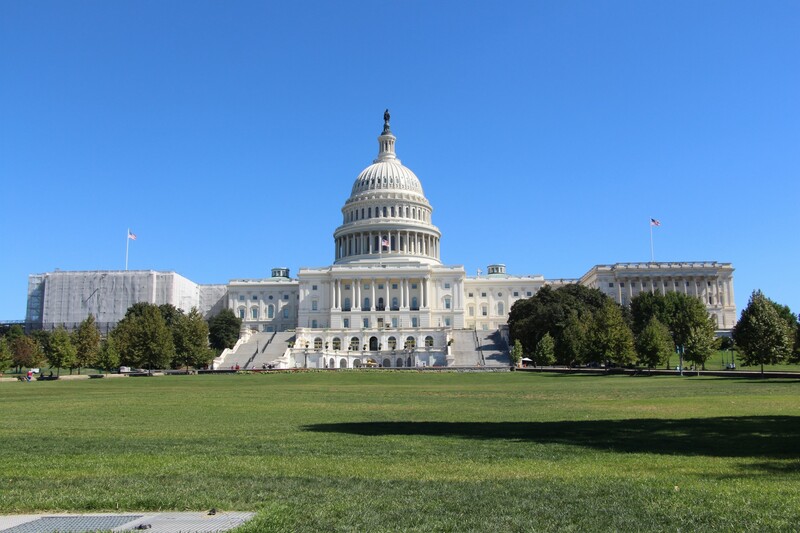 Located just four blocks from the U.S. Capitol, the AT&T Forum serves as a place for conversations and events about technology, innovation and public policy. After many in our group took tours of the television studio located inside the Forum, we heard from Governor Gary Herbert about his dealings in Washington. 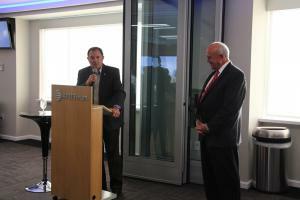 “The one-size-fits-all mentality that they have here in Washington does not work for the many,” said Herbert. 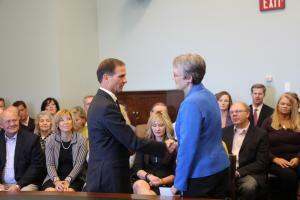 Rep. Chris Stewart served for 14 years as a pilot in the Air Force, flying both rescue helicopters and the B-1B bomber and he holds three world speed records, including the world’s record for the fastest non-stop flight around the world. His military expertise, and his position as a member of the House Select Committee on Intelligence, affords him the expertise required when influencing policy and diplomatic solutions to security issues facing our nation. 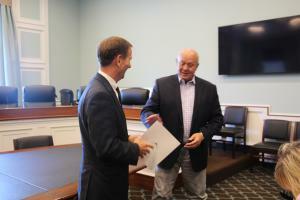 During our visit, Rep. Stewart answered questions on the threat the U.S. faces from North Korea. He referenced conversations he’d had with Adm. Harry Harris, commander of the Pacific Fleet and said, “He said North Korea is the most dangerous situation, China is the most complicated situation that we face, and Russia is the existential threat that we face.” Stewart listed three things that need to happen now to avoid a military conflict. First, he said there needs to be an intense diplomatic effort. Second, the U.S. needs an enhanced missile defense shield. And third, the U.S. needs to engage with our allies. We weren’t able to take any pictures at the Pentagon, but that didn’t make our tour any less memorable. 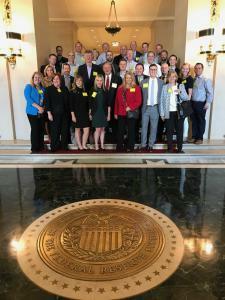 Our group was broken into three groups and then taken on a 60-minute tour that included a 1.5 mile walk through the building that highlighted the missions of the five Armed Services, the Office of the Secretary of Defense and the Joint Staff. Our tour also included a somber stop at the 9/11 memorial. The Pentagon Memorial includes both an inside and outdoor memorial dedicated to the 184 people who lost their lives when American Airlines flight 77 crashed into the building on September 11, 2001. What’s better than going to a baseball game? How about catching a foul ball? 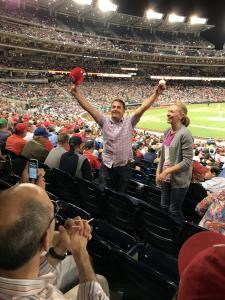 The Salt Lake Chamber group had seats in foul ball territory, right off the first base line at Nationals Park. More than a dozen balls flew over our seats and Dave Kallas from Clyde Companies was the lucky fan who caught one. Dave said it has always been a dream of his to catch a foul ball. We were so glad to be there to witness his dream come true. Nationals beat the Pirates 5 – 4. 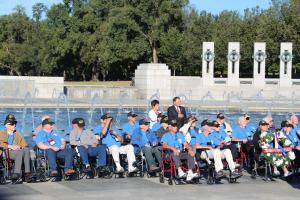 A highlight for many on our trip was the opportunity to greet 49 Utah veterans at the World War II War Memorial. Governor Gary Herbert took part in a wreath-laying ceremony at the Utah memorial site. After our visit to the WWII Memorial, the group headed back to the hotel to take part in the very popular “Hail to the Chiefs” panel discussion. This panel features the Chiefs of Staff from Utah’s Federal Delegation. 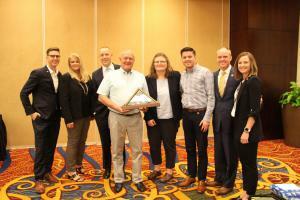 These hard-working staff members described what their positions entail; the difficult, but satisfying challenges associated with life on Capitol Hill, and how they hope to strengthen the relationship between their offices and the Utah business community. The Chiefs explained how business plays an important role in coordination and collaboration with our federal delegation. Both through the Chamber and directly with their offices, business must understand how to engage with our federal delegation to maximize our delegation’s influence and expertise. Downtown D.C., looked a lot different 20 years ago. The sidewalks were dark, prostitutes worked the streets near our nation’s capital and drugs were easy to find. Today it’s a much different place. Instead of finding homeless camps and discarded garbage on the streets of D.C., today you’ll find sidewalk cafes and food trucks. And the roads aren’t just filled with commuters in their cars, because now many people live in the downtown area and bike to work. How did the dynamic D.C. transformation take place? 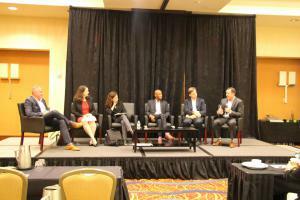 That was the focus of a panel moderated by Utah Speaker Greg Hughes. Hughes, who has been very involved in the efforts to clean up Salt Lake City’s downtown area, spent some time explaining to the panel the highlights and pitfalls of Utah’s Operation Rio Grande. We heard from Laura Zeilinger, Director of the Department of Human Services; Neil Albert, President and Executive Director of DowntownDC Business Improvement District; Chapman Todd, Chief Executive Officer of Jaydot LLC; and Christy Respress, Executive Director of Pathways to Housing DC.